The internet is constantly shaping the way real estate transactions occur. In today’s world, more than 95% of home shoppers turn to the internet to either shop for homes or research the home buying process. (¹) Not many years ago, one would begin by looking in a local newspaper or real estate publication. Today, you grab a smartphone or laptop and begin the overwhelming search online. Real estate is a business that revolves around how you present yourself and essentially “sell yourself” online. 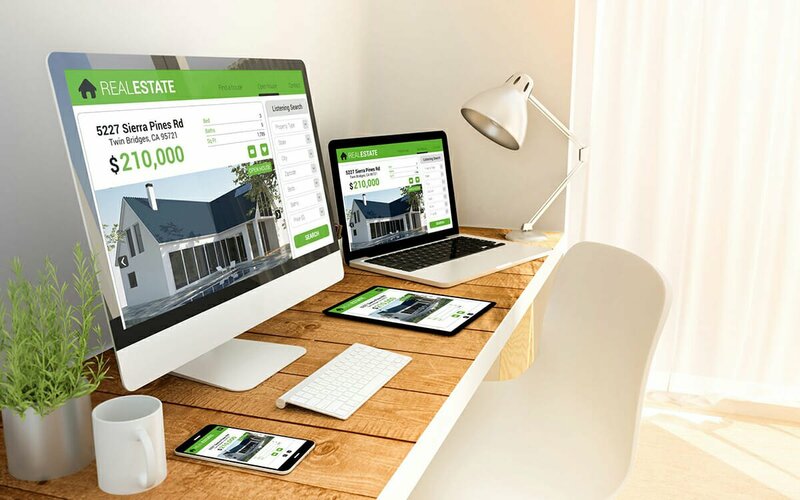 It’s a matter of establishing yourself as a real estate authority in your market, and having your own website is one way to help achieve that. The Association of Real Estate License Law Officials (ARELLO) estimates that there are about 2 million active real estate licensees in the United States. That means there are tons of competitors trying to get their own slice of the pie. By marketing yourself effectively, you can rise above the competition. Brand yourself – With your own website you dictate how you are portrayed to potential customers. Sure, you can have a template based profile page on your company website, but you have no control over that. By having your own website you are helping to create your brand online – a reflection of your authority and services you offer. Sure, a majority of people still find their agent through referrals, but how do they follow up with that agent? Googling their name. Become a resource – Anyone can have a website. Pumping that website full of relevant content can be the challenging part. Your website should serve as a place where your current and prospective clients can go to learn more about you, and the services you offer. You need to use your website, blog and social media channels to become a resource with valuable information. Stay Current – Day after day we see agent websites that not only look like they were built in the 90’s, but the content is out dated as well. Staying current with an updated website shows you are active and a viable choice! Generate Leads – This one is huge! One of the goals in having a website as a real estate agent is to get consumers off of the billboard sites, and onto yours. If your website has similar features like mapping, walk score, school information, historical data, etc – there is no reason for the consumer to leave! An effective real estate agent website will allow you to track visitor activities such as what properties are viewed, saved or Favorited. Organic Awareness – Having your own website gives you an awesome advantage in targeting localized areas. With a good real estate agent website provider, your site will have integrated SEO methods that will help give you organic juice, and higher rankings in the search engines. When a potential customer begins to look at real estate in your targeted markets, there is a higher chance that they will discover you. LiveBuyers.com offers premium real estate agent websites, at sub-premium prices. All of our websites are complete with integrated IDX, lead capture, user friendly administration, and amazing search engine optimization. Having your own real estate website is an effective way to maximize the growth of your real estate business!